Free US Vacation Beaches Newsletter - What's New? Why Coastal Oregon Vacation Beaches? Tips - Best times to visit Oregon Vacation Beaches + when NOT to drive the Coastal 101 Highway. There are some spectacular Oregon vacation beaches along the central Oregon Coast in the Florence area - from wide natural sandy beaches next to tall Sand Dunes South of Florence toward Coos Bay, and rustic rocky natural beach areas to the north up toward Newport. On our most recent trip to Oregon, we ended up staying in Florence in a great "off season rate" beach front rental house at Heceta Beach because we were unable to get a II or RCI exchange anywhere on the Oregon Coast in the Newport, Depoe Bay, or Gleneden Beach area and we did not wish to stay as far north as Discovery Bay where we were offered an exchange. Next time we will put in our exchange request even earlier for our Oregon vacation beaches Fall Vacation! Florence is a great location on Coastal Highway 101 about half way between scenic attractions and Lighthouses north around Newport, and south near Coos Bay. It also is close to the Eugene Airport via Hwy 126, and on east to the scenic McKenzie pass Hwy 242 (closed in Winter) and the many mountain ranges near the Town of Sisters. This link goes to a handy interactive Google Map of the Central Oregon Coast area showing Florence & Newport, Oregon and nearby Oregon Vacation Beaches & Attractions. The map also lists some Attraction User Reviews and Info Links. You can easily calculate driving distances and times using the "get directions" feature of the Central Oregon Coast Map. The town of Florence is in an area of large sand dunes, some up to 300 feet tall. This provides for expansive sand beaches. Immediately south of Florence is the start of the long Oregon Dune s National Recreation Area which stretches south along the beach over 40 miles almost to Coos Bay. Beautiful area of Oregon vacation beaches. A few miles north of Florence are the Sea Lion Caves plus the Heceta Head Lighthouse and assistant Light Keepers house, now a bed and breakfast. 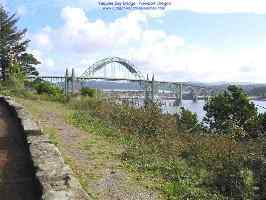 The town of Florence has an attractive Old Town Market area along the edge of the Siuslaw River. Some great riverfront dining options -- our favorites were Travelers Cove and Mo's -- both have good food and indoor and outdoor seating with views across the peaceful wide and sometimes busy river. 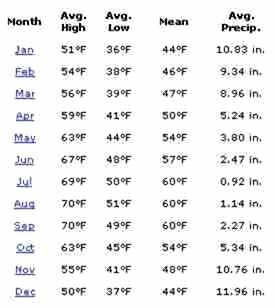 Since Rainy and foggy days are a factor to consider in Oregon, the above Precipitation and Temprature chart would suggest to go to Oregon in the summer. However, everyone else thinks that also, so be prepared for slow moving traffic backed up behind big Campers everywhere in the Summer. The good news is that Oregon has many Traffic passing lanes and pullouts and the law is that slow moving traffic has to use them. Oregon has a high Camper Ownership ratio - and a lot of visitors with campers - there are nice well kept campgrounds everywhere - staffed by volunteers who usually live in their camper on a hookup spot provided by the Oregon Park Service. The "Locals" will tell you that the traffic to coastal Oregon vacation beaches - campers and otherwise - starts to die down in September, and has really dropped off by October - even though the Autumn Foliage is beautiful in the Oregon mountains and one would think more people would want to experience it. Much of the colorful Fall foliage of the Oregon forests is only a short drive from some great oceanfront resorts on the central Oregon coast. (See our Oceanfront Oregon Coast Beach Rentals & Reviews page) Many people just haven't "discovered" Oregon for Fall vacations yet, we think -- all the better for those who have! The last time we went to Oregon, we went the third week of October. We encountered almost no backed up traffic on the Coastal 101 Highway and had no problems walking right in to the Lighthouse tours and other attractions - many of which close for the season October 31. The weather was cloudy with scattered drizzle about half of the 10 days we were there, but people we know there said there were usually not that many showers at that time of year. The prior week had been entirely sunny. We ended up being at the tail end of the Fall Peak Color for the Autumn leaves in the inland forests however, so next time we plan to go to Coastal Oregon the first or second week of October Vs the third week. Note the average rainfall in October is still much lower than the 10" monthly averages in the Winter months and one would expect less rainy days in early October than late. Tip Avoid doing long drives on the Coastal Highway 101 on Friday afternoon, Saturday morning, and Sunday afternoons if possible to miss "Local" crowds and campers going to and from campgrounds for weekend. Seems obvious, but many people forget about the days of the week when they are on vacation and not going to work everyday. We have found it is much better to plan so as to allow a day to unwind and relax at the beach and check out "local" points of interest between days of driving on Day Trips to make it easier on the Kids - and the Adults! Please send us any good Oregon vacation beaches points of interest or Vaction Attractions which you have discovered that are not mentioned here. Or send us your Site Comments on our Comments & Suggestions Page. Thanks! Send Gene your Comments and/or Suggestions using the Form below. We always enjoy hearing from our Site Viewers! Looking for Something Specific? Search 2 of our US Vacation Sites.